This wedding ceremony at Ambassador Mansions and Gardens in Pasadena may be one of the last to be held in this area of the property, at least for the foreseeable future. I've been told that weddings are no longer permitted in this area due to landscaping concerns—and that really makes me sad. As you can see from this photograph, the huge tree in the background during the processional photography creates an unequaled sense of grandeur. The light streaming through the large branches and leaves seems to bless the scene. And, since this ceremony configuration means that the wedding party as well as the bride and bride's father are entering from the west, a beautiful backlight is almost certainly assured. 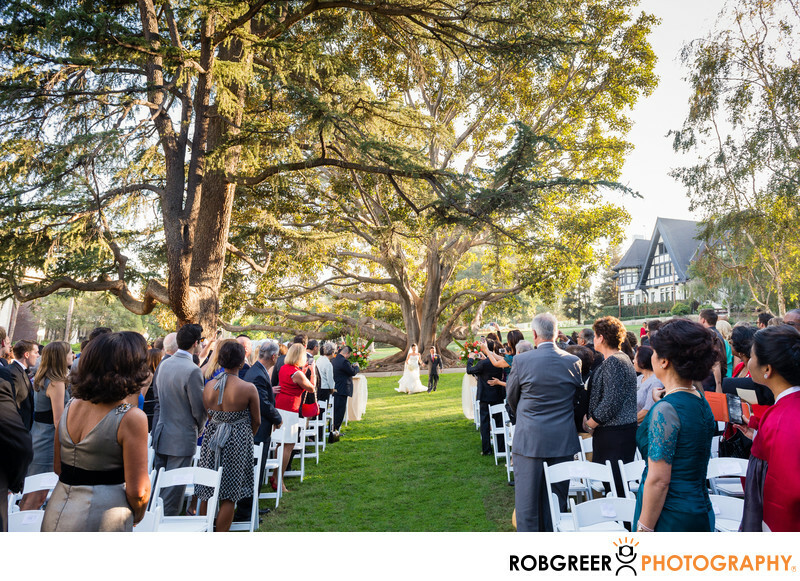 As you see here, I enjoy photographing a wide vista during a wedding processional in order to not only capture the overall scene, but also to record the many guests in attendance. As you view this photo, your attention is probably drawn to the father of the bride escorting his daughter down the aisle. However, if you're the bride in this photograph, once you receive this kind of image your attention is going to be drawn to the guests and their expressions and actions as they witness you walking down the aisle. When the bride in this photograph first saw this image, her first comment was about the height of her father compared to her and how she wished that she wasn't wearing such high heels on her wedding day. Ambassador Mansions and Gardens is located in Pasadena, California. Website: http://ambassadorcampus.com/. Contact Person: Sylvia Noland, (310) 292-5393, sylvianoland@aol.com. 1/100; f/6.3; ISO 800; 24.0 mm.